On the last day of 2015 Metropolis looks back on the year and some of the most notable of the 6,000 + office moves and business opportunities we researched during the year. Financial Conduct Authority‘s pre-let of 425,000 sq ft of offices at Lend Lease’s International Quarter in Stratford, London, E15 was the largest deal of the year and the requirement was first tipped by Metropolis in autumn 2013. Ashurst, the law firm, pre-let the 275,000 sq ft Fruit and Wool Exchange Building in the City of London in July 2015. Metropolis has been reporting on Ashurst’s plans since early 2013. Royal Bank of Canada took 250,000 sq ft at the planned 100 Bishopsgate scheme in November 2015, however Metropolis has been writing about its requirement for up to two years prior to the deal. DLA Piper signed for 140,000 at a refurbished Mitre House in London, EC2 in summer 2015. However Metropolis has been tracking DLA Piper’s requirement since June 2013. Bouygues signed for 72,000 sq ft at Becket House, Lambeth Palace Road, London, SE1 in December 2015 after a search which Metropolis has been updating clients on since mid-2011. KPMG signed for a 60,000 sq ft move to Sovereign Street in Leeds in a move first tipped by Metropolis in 2011. Shoosmiths, the law firm, signed a pre-let to take 32,000 sq ft over 2 floors at Allied Londons XYZ Building after a search (often denied by the firm itself) first tipped by Metropolis in early 2013. BDO LLP, the accountant, signed for 24,000 sq ft in the Snow Hill area of Birmingham in November 2015 after a search that started in early 2014. Audit Scotland signed for 15,000 sq ft at 2-6 George Street, Edinburgh in November 2015 after a search first tipped by Metropolis in May 2013. EDF Energy was close to a 70,000 sq ft deal at Finzels Reach, Bristol in December 2015 after a search first reported by Metropolis in January 2013. As we prepare to research for the next 6000 office movers of 2016 – A Happy and Prosperous New Year to all Metropolis blog readers! A recent report from property consultant Savills highlighted the upsurge in office demand in Cardiff and forecast that rents would reach £25 per sq ft in 2016. The report concluded that total take-up at the end of Q3 stood at nearly 300,000 sq ft (27,860 sq m) and with the last two months registering significant prelets, including the 150,000 sq ft letting at Central Square to the BBC and Public Health Wales pre-letting 4,645 sq m (50,000 sq ft) of new offices on four floors at the under construction 2 Cathedral Quarter; the annual take-up total will reach 600,000 sq ft a 10% increase on 2014 and 20% up on the ten year average. at Cardiff Gate Business Park. Savills predict that One Central Square and 2 Capital Quarter buildings, could be fully let by early 2016. Therefore the main schemes in the pipeline are refurbishments including 50,900sq ft at St Patricks House, 35,000 sq ft at 2 Kingsway and 16,953 sq ft at Haywood House North on Dumfries Place,. Metropolis is tracking over a dozen medium or large companies searching for office space in Cardiff. Merry Christmas and a Happy New Year to all Metropolis blog readers from all the staff at Metropolis. Metropolis and Cityoffices have completed their bi-annual ‘Skyline’ survey of the central London office development market for the period April 2015 to October 2015. 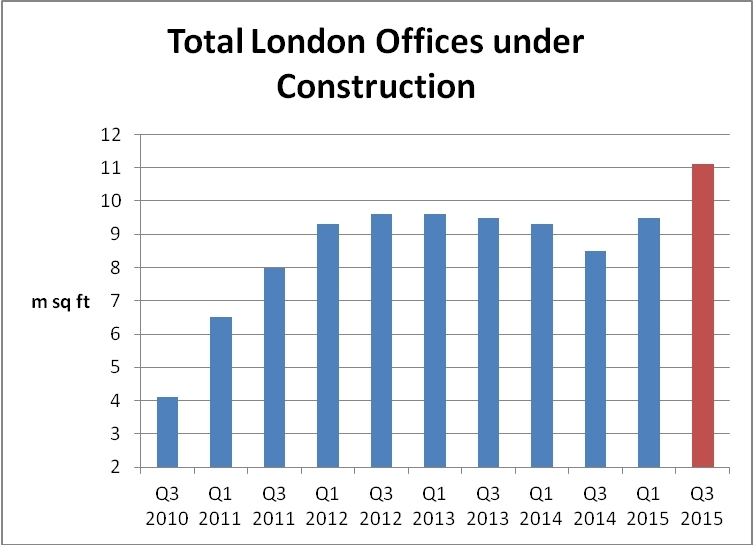 The survey takes a snapshot of the central London office construction in Q4 2015, recent completions, recent pre-letting activity and looks ahead to future pipeline projects that will shape the next three years. There are now 78 office schemes under construction in central London (compared to 74 six months ago) totaling an increased 11.1m sq ft (9.5m sq ft in April 2015). In the last six months there have been 31 new scheme starts, totaling 3.4m sq ft, including major new-builds such as the 866,000 sq ft 100 Bishopsgate in EC3, the 400,000 sq ft 10 Fenchurch Place in the City of London and the 228,000 sq ft 33 King William Street (33 Central) in EC4. The City dominates construction with 6m sq ft of new office space in schemes now underway (up from 4m sq ft in early 2015). There is now 500,000 sq ft of office space under construction at Kings Cross, with more at site clearance stage. The West End, including Paddington, has 2.7m sq ft under construction and a further 600,000 sq ft of office build is on-site in Midtown, but Southbank and Docklands still lag behind the rest of London. The big story is the forthcoming space at demolition stage, with over 7m sq ft lined up to start in early 2016 and more to follow later in the year. In reality, further schemes currently at planning stage will add to these numbers, particularly the 2017 and 2018 totals. Therefore we expect development completions in 2017 and 2018 could reach 7-8m sq ft. Looking ahead, some 33 future schemes are currently at site preparation stage with 7.2m sq ft of additional office space due to go under construction in the next 6 months. Many of these schemes will not be completed until 2017 or 2018, however it is clear there is a strong development pipeline. The full Skyline report is currently available to Metropolis clients. Further details on the Metropolis service can be found at http://www.metroinfo.co.uk. Central London office lettings bounced back with 1.15m sq ft of transactions in November 2015, spread across 56 deals during the month. 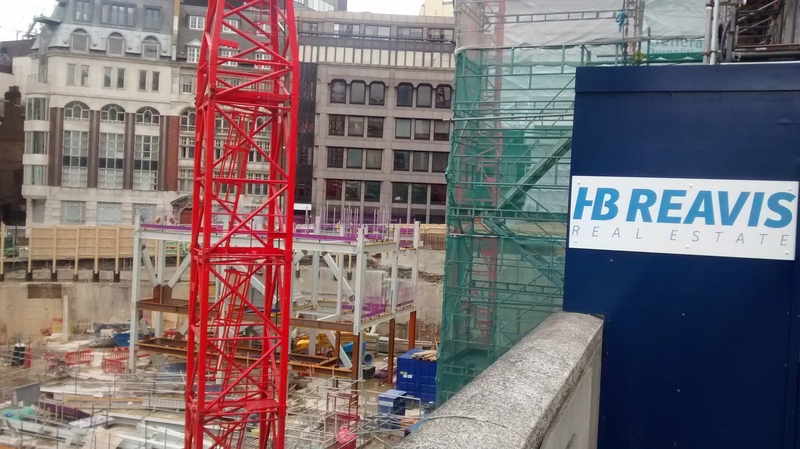 November was characterised by 14 deals over 20,000 sq ft, including Royal Bank of Canada at 100 Bishopsgate, EC3; Bouygues at Becket House, 1 Lambeth Palace Road SE1; Crossrail at Westferry Circus, E14; Pivotal at The Warehouse, EC1 and and Ineos at 38 Hans Crescent, SW1. Financial services topped the table of lettings by sector, helped by the Royal Bank of Canada deal, followed by construction boosted by Bouygues. Professional and insurance sectors are also performing well. Office deals under offer remained steady at 3.7m sq ft.
By area, the City accounted for nearly two thirds of the total space let at 62pc of the floorspace let in the month. Current London office demand is calculated to be around 6m sq ft in the City and 3.5m sq ft in the West End. The volume of grade A (newly built or refurbished office space) let during the month reached 487,000 sq ft (42% of the total), as transactions for newly developed or refurbished space took a large part of the total. There is 4.1m sq ft of already pre-let office space in the City now under construction. Metropolis is about to publish a new report on upcoming London office schemes for Christmas 2015. Office Leases – How Long? Recent research by property consultant Strutt & Parker and MSCI (underlined by recent Metropolis research) reveals that lease lengths have fallen to an historical low, which is leading to a greater volume of office moves than seen in previous decades. In the last 25 years average lease lengths have fallen from just over 20 years to 7.2 years by early 2015 in all sectors and 6.9 years in the office sector. In fact, if the short leases in serviced office buildings are taken into account the average lease length is set to fall further. The report reveals that 73% of leases signed in the UK in 2015 were for 5 years or less. ten year leases are now a relative rarity, although generally, the larger the building and tenant the longer the lease. London office leases average 6.3 years, with South East leases at 6.1 years. Nearly 38% of office leases include a tenant lease break option and are most common in leases of 6-10 years. Perhaps of most interest to companies operating in the office relocation market is the outcome of decisions when companies approach lease expiry. The survey shows that 71% of office tenants vacated their offices at or in advance of expiry with 26% renewing. Of those tenants that renewed their leases, 43% waited to within 3 months of the renewal date to sign the new lease. Those tenants that moved commonly relocated to a building with less expensive rents. However only 24% of office tenants with a lease break option exercised that option. In conclusion, with large numbers of office tenants taking short leases and increasingly looking to vacate premises when leases expire, the business opportunities to assist office tenants in relocations have never been higher. Metropolis provides a weekly digest of many of these opportunities.